2استادیار، گروه علوم باغبانی و مرکز پژوهشی گیاهان ویژه منطقه، دانشکده کشاورزی، دانشگاه بیرجند. 3مربی، گروه زراعت و اصلاح نباتات، دانشکده کشاورزی، دانشگاه بیرجند. به منظور بررسی تأثیر اسید هیومیک و تراکم کاشت بر فعالیت آنتی‏اکسیدانی و مواد مؤثره زعفران sativus L.) (Crocus آزمایشی در سال 1394 به‌صورت فاکتوریل در قالب طرح پایه بلوک‏های کامل تصادفی در دانشکده کشاورزی دانشگاه بیرجند اجرا شد. تیمارهای آزمایش، شامل چهار سطح اسید هیومیک (صفر، 5، 10 و 15 کیلوگرم در هکتار) و سه سطح تراکم کاشت (50، 75 و 100 بنه در مترمربع) با سه تکرار بودند. نتایج نشان داد که تیمارهای مورد بررسی، اثر معنی‌داری بر فعالیت آنتی‌اکسیدانآنتی‌اکسیدانی گلبرگ (آنتی‌اکسیدان، فنول و آنتوسیانین) و مواد مؤثره زعفران (پیکروسین، سافرانال و کروسین) داشتند. بیشترین میزان آنتی‌اکسیدان (78/69 درصد) در تیمار 5 کیلوگرم در هکتار اسید هیومیک و تراکم 50 بنه در مترمربع مشاهده شد، اما محتوی فنول تحت تأثیر تیمارهای آزمایش قرار نگرفت. همچنین بالاترین میزان آنتوسیانین (40/46 میلی‌گرم در صد گرم وزن خشک) با کاربرد 10 کیلوگرم در هکتار اسید هیومیک و تراکم کاشت 75 بنه در مترمربع به دست آمد. نتایج مواد مؤثره زعفران نشان داد، که بیشترین عملکرد پیکروسین (60/40 درصد) در تیمار 15 کیلوگرم در هکتار اسید هیومیک و تراکم کاشت 75 بنه در مترمربع بدست آمد. همچنین بالاترین مقدار سافرانال (17/20 درصد) و کروسین (57/55 درصد) با کاربرد 10 کیلوگرم در هکتار اسید هیومیک و کمترین آن‌ها در تیمار شاهد (70/15 درصد) و (12/43 درصد) مشاهده شد. به‌طور کلی، نتایج بیانگر تأثیر مثبت اسید هیومیک و تراکم کاشت بر فعالیت آنتی‌اکسیدان و مواد مؤثره زعفران بود. 3Preceptor in Agronomy and Plant Breeding Sciences, Faculty of Agriculture, University of Birjand. The effects of applications of humic acid and planting density on antioxidant activities and components of saffron were evaluated under field conditions. Treatments were of four levels of humic acid (0, 5, 10 and 15 Kg.ha-1) and three densities of planting (50, 75 and 100 corms.m-2). The experiment was designed in randomized block design with three replications at the research station of the Faculty of Agriculture at the University of Birjand during the growing season of 2015. Petal antioxidant compounds (antioxidan, total phenol and Anthocyanins) and active ingredients of saffron (picrocin, safranal and crocin) were influenced by humic acid and planting density treatments. The highest antioxidant activity (69.7%) was obtained in plants treated with 5 kg.ha-1 humic acid with a planting density of 50 corms.m-2. However, no significant difference was found in phenol content under different treatments. The highest anthocyanin content (46.4 mg.100 g-1) was observed in 10 kg.ha-1 humic acid with a planting density of 75 corms.m-2. Picrocin content was influenced in response to humic acid planting density and the highest value (40.60%) was obtained from 15 kg.ha-1 humic acid with a planting density of 75 corms.m-2. The highest safranal (20.1%) and crocin (55.57%) were obtained in plants treated with10 kg.ha-1 acid humic, while the lowest values were recorded in the control (15.70%) and (43.12%) respectively. Thus, the results showed that humic acid and planting density have strong impacts on antioxidant compounds and active ingredients of saffron under field conditions. Ahmadian, A., Ghanbary, A., Gluy, M., Siyahsar, B., and Arazmjoo, A. 2010. Different irrigation regimes and manure on the elements essential oil content and chemical composition cumin. Ecophysiology of Crop Plants and Weeds 16: 83-94. Alavi-Shahri, H., Mohajeri, M., and Folaki, M.A. 1994. Evaluation of plant density (planting distanse) on saffron yield. Proceedings of 2nd Meeting of Saffron and Medicinal Plant Agronomy, Gonabad, Iran, 8-9 November 1994, p.13-20. Behdani, M.A., Koocheki, A., Nassiri, M., and Rezvani Moghaddam, P. 2006. Evaluation of quantitative relationships between saffron yield and nutrition (on farm trial). Iranian Journal of Field Crops Research 3:1-14. (In Persian with English Summary). Chuah, A.M., Lee, Y.C., Yamaguchi, T., Takamura, H., Yin, L.J., and Matoba, T. 2008. Effect of cooking on the antioxidant properties of colored peppers. Food Chemistry 111:20-28. Daneshvar Kakhki, M., and Farahmand Gelyan, K. 2012. Review of interactions between e-commerce, brand and packaging on value added of saffron: A structural equation modeling approach. African Journal of Business Management 6 (26): 7924-7930. Edrisi, B. 2009. Post harvest physiology of cut flowers. Publications Payam Digar, Arak. Fu Jiu, C., Dao Qi, Y., and Quing Sheng, W. 1995. Physiological effects of humic acid on drought resistance of wheat (in Chinese). Yingyong Shengtai Xuebao 6: 363–367. Golzari, M. 2016. Effect of bio-fertilizer and mother corm weight on growth, flower and stigma yield and qualitative criteria of saffron. M.Sc dissertation, Faculty of Agriculture, University of Birjand, Iran. (In Persian with English Summary). Heidari, Z., Besharati, H., and Maleki Farahani, S. 2014. Effect of some chemical fertilizer and bio fertilizer on quantitative and qualitative characteristics of saffron. Saffron Agronomy and Technology 2 (3): 187-189. (In Persian with English Summary). Haghirossadat, F., Bernard, F., Kalantar, M., Sheikhha, M., and Hokmollahi Azimzadeh, M. 2010. Bunium Persicum (Black Caraway) of Yazd province: Chemical assessment and Evaluation of its antioxidant effects. Journal of Shaheed Sadoughi University of Medical Sciences 18 (3): 284-291. Ismaeili, V., moradi, P., and Ansari, Kh. 2015. Changes of crocin, picrocrocin and safranal in saffron (Crocus sativus L.) treated with compost and biological fertilizations. The first national conference on the use of medicinal plants and traditional medicine in life style, University of Torbat Heidariyeh, Iran, 6 December 2015, p. 46.49. (In Persian with English Summary). Khan, A., Guramni, A.R., Khan, M.Z., Hussain, F., Akhtar, M.E., and Khan, S. 2012. Effect of humic acid on growth, yield, nutrient composition, photosynthetic pigment and total sugar contents of peas (Pisum sativum L). Journal of Chemical Society of Pakistan 6: 56-63. Koocheki, A., Jahani, M., Tabrizi, L., Mohammad-Abadi, A.A., and Jahan, M. 2009. Effects of biofertilizer and inorganic fertilizer on generative growth and yield of saffron under high corm density. 3rd International Symposium on Saffron. Forthcoming Challenges in Cultivation, Research and Economics, Krokos, Kozani, Greece, 20-23 May 2009, p.14. Kuntal, D., Raman, D., Thippenahalli, N.S., and Sekeroglu, N. 2007. Influence of bio-fertilizers on the biomass yield and nutrient content in Stevia rebaudiana. Journal of Medicinal Plants Research 1 (1): 5-8. Koocheki, A., Siahmarguee, A., Azizi, G., and Jahani, M. 2011. The effect of high density and depth of planting on agronomic characteristic of saffron (Crocus sativus L.) and corms behavior. Journal Agroecology 3: 36-49. (In Persian with English abstract). Koocheki, A., Rezvani Moghaddam, P., Mollafilabi, A., and Seyyedi, S.M. 2014. The effects of high corm density and manure on agronomic characteristics and corms behavior of saffron (Crocus sativus L.) in the second year. Journal of Saffron Research 1 (2): 144-155. (In Persian with English Summary). Lozano, P., Castellar, M., Simancas, M., and Iborra, L. 1999. Quantitative high-performance liquid chromatographic method to analyze commercial saffron (Crocus sativus L.) products. Journal of Chromatography 830: 477-483. Malakuti, M.G. 1996. Resistant agriculture and yield increase with optimization use fertilizer in Iran. 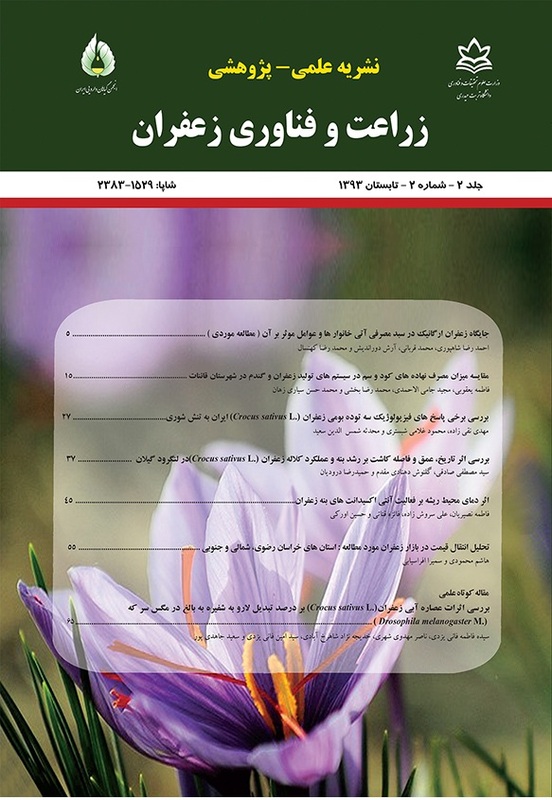 Instruction Agriculture Publication, Tehran. (In Persian). Mohammad-Abadi, A.A., Rezvani-Moghaddam, P., and Sabori, A. 2007. Effect of plant distance on flower yield and qualitative and quantitative characteristics of forage production of saffron (Crocus sativus L.) in Mashhad conditions. Acta Horticulturae (ISHS) 739: 151-153. Mohebi, N.K., and Klarestaghi, B. 2012. Effect of animal manure and crop density on saffron (Crocus sativus L.) flowering. 12th Iranian Crop Science Congress, Islamic Azad University, Karaj Branch, Iran, 6-9 September, p.34-37. (In Persian with English Summary). Molina, R.V., Valero, M., Navarro, Y.J., Guardiola, L., and Garcia-Luice, A. 2005. Temperature effects on flower formation in saffron (Crocus sativus L.). Sciatica Horticultural 103: 361-379. Naghdi Buddy, H., Omidi, H., Golzad, A., Torabi, H., and Fotoukiyan, M. 2011. Changes of crocin, picrocrocin and safranal and agronomic characteristics of saffron (Crocus sativus L.)the impact of biological and chemical phosphate fertilizers. Journal of Medicinal Plants 4 (40): 58-68. (In Persian). Nieto, K.F., and Frankenberger, W.T. 1991. Influence of adenine, isopentyl alcohol and Azotobacter chroococcum on vegetative growth of Zea mays. Plant Soil135: 213-219. Omidi, H., Naghdi Badi, H., Golzad, A., Torabi, H., and Fotoukiyan, M. 2009. The effect of chemical and bio-fertilizer source of nitrogen on qualitive and quantitative of saffron (Crocus sativus L.). Journal of Medicinal Plants 2 (30): 98-109. (In Persian). Patten, C.L., and Glick, B.R. 1996. Bacterial biosynthesis of indole-3-acetic acid. Canadian Journal of Microbiology 42: 207- 209. Rasouli, Z., Maleki Farahani, S., and Besharati, H. 2015. Saffron (Crocus sativus L.) yield as affected by different fertilizing systems. Iranian Journal of Medicinal and Aromatic Plants 31 (2): 204-219. (In Persian with English Summary). Remon, S., Ferrer, A., Marquina, P., Burgos, J., and Oria, R. 2000. Use of modified atmospheres to prolong the postharvest life of burlat cherries at two different degrees of ripeness. Journal of the Science of Food and Agriculture 80 (10): 1552-1545. Rouhani, R., Eyenafshar, S., and Ahmadzadeh , R. 2015. Study of anthocyanin and antioxidant compounds derived ethanol extract saffron flag with the help of ultrasound technology. Iranian Food Science and Technology 11 (2): 161-170. Sabzevari, S., Khazaie, H.R., and Kafi, M. 2010. Study on the effects of humic acid on germination of four wheat cultivars (Triticun aestivum L.). Journal of Iranian Field Crop Research 8 (3): 473-480. (In Persian with English Summary). Santiago, A., Lose, M., Carmona, E., and Delgado, A. 2009. Humic substances increase the effectiveness of iron sulfate and vivianite preventing iron chlorosis in white lupin. Bio- Fertilizer Soils 44: 875-883. Sharif, M., Khattak, R.A., and Sarir, M.S. 2002. Effect of different levels of lignitic coal drived humic acid on growth of maize plants. Communication in Soil Science and Plant Analysis 33: 3567-3580. Sidari, M., Atina, E., Francioso, O., Tugnoli, V., and Nardi, S. 2006. Biological activity of humic substances is related to their chemical structure. Soil Science Society of America Journal 71: 75-85. Toor, R.K., Geoffrey, P., and Savagea, A.H. 2006. Influence of different types of fertilizers on the major antioxidant components of tomatoes. Journal of Food Composition and Analysis 19: 20-27. Turkmen, N., Sari, F., and Veliglu, Y.S. 2005. The effect of cooking methods on total phenolic and antioxidant activity of selected green vegetables. Food Chemistry 93: 713-718. Wrosotad, R.E. 1976. Color and pigment analysis in fruit products. Oregon State University Publications Limited, Cornwalis. Zhang, X., and Schmidt. R.E. 1999. Antioxidant response to hormone containing product in Kentucky bluegrass subjected to drought. Crop Science 39: 545–551. Zhang, X., and Schmidt, R.E. 2000. Hormone-containing products impact on antioxidant status of tall fescue and creeping bent grass subjected to drought. Crop Science 40: 1344–1349.